Thank you for all the fan mail on the Dow to offset the hate mail on the metals. The objective is to expose the real world we live in and how domestic policy objectives are really held hostage to international capital flows. We are really trying hard to get everything up and running ASAP. Many are starting to realize why we were the largest institutional advisers ever. This is not about personal opinion. It is about monitoring the world and explore how it functions forgetting the nonsense of one dimensional relationships that always flip and fail anyhow. When you see the world as one entity, you are on your way to becoming a savvy investor. The following is a passage from the updated Greatest Bull Market in History we hope to have out by the end of the year covering the evolutionary process. It has been extended dramatically expanding the time frame before and after. Here is a period where during the War the Fed was ordered by Congress to support the US debt at PAR despite the fact that inflation was soaring. This illustrates the problem with politicians. They try to have their cake and eat it too. 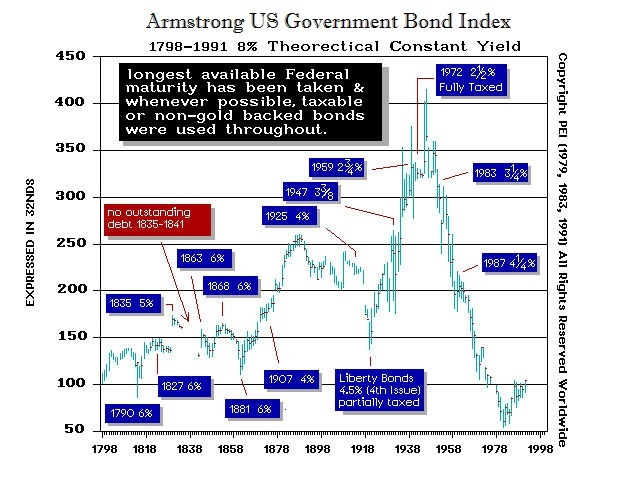 In August 1942 the Federal Reserve System was ordered to maintain a low interest rate peg on government bonds after the United States entered World War II. It did so at the request of the Treasury to allow the federal government to engage in cheaper debt financing of the war. What they did not understand was the impact of international capital flows. To maintain the pegged rate, the Fed was forced to give up control of the size of its portfolio as well as the money stock. While the assumption was they needed the Fed to suppress interest rates, in reality, the rates were artificially maintained higher than they would have been otherwise. With capital fleeing Europe, rates in the US would have gone perhaps negative as we saw during the 2008-2009 crisis both in the USA and Germany. Eventually a conflict between the Treasury and the Fed erupted when the Treasury directed the central bank to maintain the peg after the start of the Korean War in 1950. This led to the resignations and eventually the March 1951 Accord ending the ordered Fed intervention. Therefore, the various measures taken by the U.S. government during 1950 and 1951, which on the surface would lead one to believe they were bearish for the U.S. stock market, had no significant effect. On September 23, 1950, Congress passed the Revenue Act to raise income taxes as well as corporation taxes. By 1951, the U.S. Treasury collected $56.1 billion in taxes, the highest in history. Margin profit ceilings were imposed upon 200,000 consumer items in February 1951 by the Office of Price Stabilization. Wages and salaries were frozen on January 26, 1951 by the Wage Stabilization Board for the second time in modern history, amounting to $71.6 billion. All these measures, along with higher interest rates and 75% margins on stock purchases, could not prevent the U.S. market from rising. Today, the Fed’s massive bond buying program is being compared to some degree with this event. However, what they miss once again are the capital inflows. The fundamental macro-economic backdrop they are claiming is really bearish for the stock market because they claim the Fed’s interest rate policy during the war led to the Dow Jones Industrial Average continued advance despite a sharp eight-month recession. They again focus purely on domestic circumstance whereas the 1945 recession was a period where equity indices ignored the economy and advanced more than 20%. What they miss is the international capital flows and the fact that despite the fixing of low interest rates by the Fed on orders from the Treasury, real inflation was taking place in assets. Yes there was a recession that emerged after the war. However, the US was intact whereas Europe was not being ravaged by war. The Dow rallied as the bonds collapsed as illustrated here. Equities have continued to rise to new all-time highs and the European recessionary statistics are once again illustrating that the US economy is the only game in town. Instead of capital fleeing for fear of war in Europe and the inability to trust even banks, ironically the same result is unfolding but because of the brain-dead political policies in Europe confiscating depositor’s assets rather than bailing out the banks. Why are equities ignoring a recession again? It boils down to capital flight. The circumstances today create the same result as if it were World War III in Europe. If we look at the Dow and its performance during the previous period of capital flight, the Dow rallied for 11 years between 1950 and 1961 before making a serious correction. It then resumed into 1966 and then consolidated for 19 years into 1985 as gold did from its 1980 high. How far will the Dow go before making a serious correction? 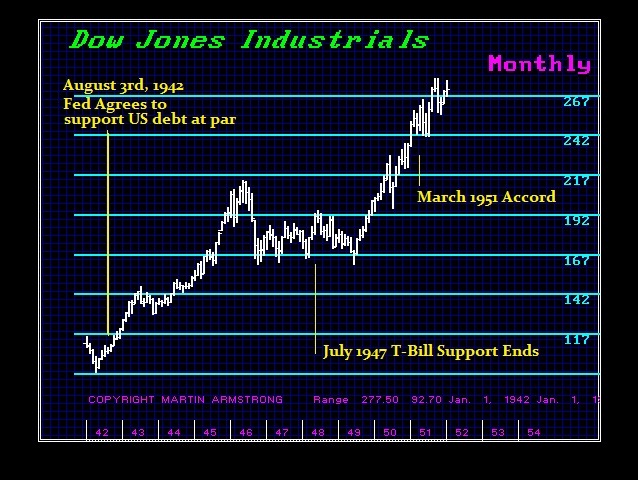 Will the Dow rise with higher interest rates as it did after 1951 for 10 years? These are questions we are address in the coming special reports.